Anyone in the metro D.C. area who regularly posts photos to their own photoblog or flickr site is welcome to submit photos for consideration. You can send in 3 photos per month and they should be at least 300 dpi and 8x10 inches in size. You should also include a brief description for each photo submitted. 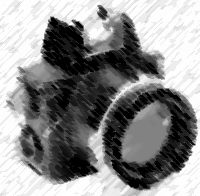 We also require that you send us the URL for you photoblog or flickr site. While you won't receive any fee if you photo is selected, we will publish your work along with the URL of your site. A couple of words of caution; since both your photo and your site's URL will be appearing in the Washington Post Magazine, we will be screening for 'family friendly' content. Also, if you photograph people in public places, you don't have to get their permission for us to publish their picture; however, when it comes to submitting photographs of children, only do so when you know you have the parent's consent. We won't be able to publish the photo without that. Email your submissions to - blogcity@washpost.com. The Dark Side of the Mountain - Michael Leahy, The Washington Post Magazine. "Lisi wouldn't need to send Nils Antezana's effects anywhere. He wouldn't need to do a thing because Antezana's daughter, Fabiola, would be flying to Katmandu, Nepal, within four days to get both the effects and a meeting with Lisi, during which she would demand an explanation for what had happened. 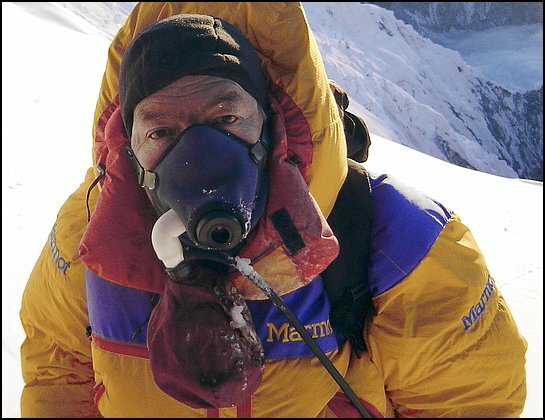 What she had heard in telephone calls made to other climbers led her to believe that Lisi had made mistakes no guide should make, and therefore was responsible at least in part for her father's death. Fabiola knew she wouldn't be bringing her father back, but she wanted to leave Katmandu with the truth about how his dream went awry." Washington Post photographer Andrea Bruce Woodall has traveled to Iraq five times since the war began. Most recently, she arrived a week shy of the first anniversary of the invasion in March and stayed through a period in which a widespread insurgency against the U.S. occupation flared anew, and U.S. fatalities approached 1,000. For some Americans, the chaos and violence in Iraq has receded to a kind of grim background noise, distant and impersonal. Woodall set out to dispel that creeping indifference by getting up-close and specific. 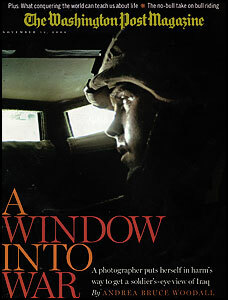 Here, through her camera's lens and her personal journal, is Iraq as it's seen from the bulletproof window of a Humvee. The photos in this week's magazine were sitting, unpublished, on Andrea's memory cards and the words were in the personal journal she kept on her travels covering the war in Iraq. Finding these images and putting them on the page with her words is the best work a photo editor can do. Sometimes it is frustrating being second best. First, the New York Times Magazine introduced 'T', a beautiful new style and design mag, and then this past Sunday, there was the great text-great photos spread on director Pedro Almodovar. What helps set the N.Y. Times Magazine apart is the great connection between their print and web products. While we (The Washington Post Magazine) have a great story on a neighborhood pool with a fabulous portrait series by Greg Miller, all you'll see on the web is the cover image and ONE photo from the story. In contrast, the Almodovar story's online version includes a photo gallery (of Almodovar's female stars), an audio slideshow, and a dip into the Time's Almodovar archive to round out his film career. As newspapers struggle to find a future in a world where people don't read, and websites try to create an audience for people who have less and less time; The New York Times type of symbiotic relationship between print and web seems like an excellent way to move your old readers forward and to capture some new readers as well. Everyone in print looking for the new business model should be paying attention.